The first projection mapping at the White House appeared during Halloween with Trick or Treat festivities for close to 5,000 military families and area school children. 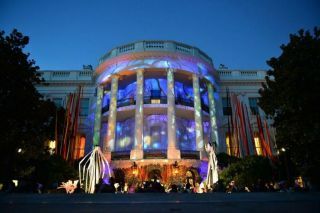 WorldStage participated in the event supporting the University of North Carolina School of the Arts in illuminating the South Portico of the White House. The Trick or Treat event began after school and continued until early evening. President Obama and First Lady Michelle Obama distributed treats as 85 costumed acrobats and entertainers transform the South Lawn into an Enchanted Forest. At night, the White House was illuminated with holiday-colored lights and gobos and a 4.5-minute video loop was mapped onto its columns and balcony of the South Portico. The video, created by UNCSA alumni, consisted of graphical content that played in a loop until 11 p.m. and was visible to by-passers. Frankenstein-style electricity crawled up and down the portico’s columns as sparks made the columns appear to sway. A gigantic full moon rose and set; ghosts darted back and forth and huge black cats stalked the White House. Jack O’Lanterns piled up between the pillars, and skeletal bare trees were outlined against a purple landscape where bats flew and spooky eyes glowed. Even presidential dogs Bo and Sunny made an appearance before the orange, white and blue star-spangled ending. WorldStage provided a pair of d3 4x4pro with VFC card option for the five-output show. d3 Technologies sent specialist Zak Haywood to man the media server, and Nationwide supplied five Christie HD20K-J series projectorsThe WorldStage contingent of Donoghue, fellow UNCSA alumnus, senior technology specialist Michael Kohler, and senior projectionist Dennis Alfonso traveled to Washington on Wednesday to join the UNCSA faculty and students in setting up equipment for the Friday event. WorldStage provided a pair of d3 4x4pro with VFC card option for the five-output show. d3 Technologies sent specialist Zak Haywood to man the media server. Nationwide supplied five Christie HD20K-J series projectors, which were mounted on scaffolding on the South Lawn. “Everything went well and everyone was very appreciative of the lighting and projection mapping,” Donoghue said. The team got a treat of their own when they had a brief opportunity to meet the President and First Lady before the event got underway.